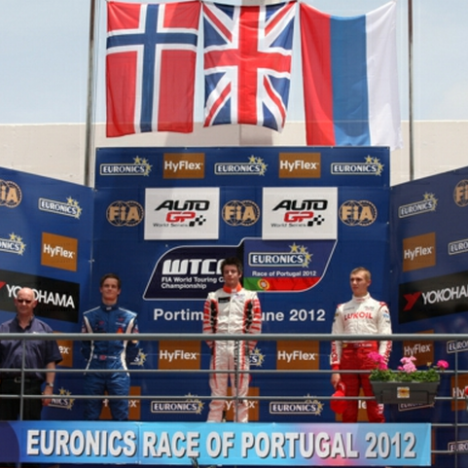 P2 and Podium in Race 1 in Portimao, Portugal! 02.06.2012 After a dramatic qualification on Friday, I was ready to gain positions in Race 1 today. The weather was sunny and pretty hot, and most people around me were a bit nervous. We had decided to try an opposite pit stop strategy from what lead us to victory in Budapest a few weeks ago. In Budapest we took a very late pit stop, but this time we concluded that it possibly could be a beneficial move to take a very early pit stop for this particular race. And it was! I started off in P5 on the start grid, and in the first lap in the first corners I got side by side with Guerin, with me on the outside of Guerin. This was a fight for P4, but he had the advantage on the inside. Eventually I dropped to P6 in the first lap, and the top 6 was driving hard and close with Quaife-Hobbs in the lead. I was the first driver to make a pit stop, in lap 4. We made a smooth and effective, fast pit stop. Since I was the only driver to make a pit stop so early in the race, I was driving last and alone for several laps till somebody else took their pit stop. Then driver after driver took their pit stops, and everybody came out behind me, except Sirotkin, which got side by side, and in front of me through the first corner after his pit stop. He had colder tires, so I passed him after a few corners, and got some distance. Quaife-Hobbs had a late pit stop strategy, and got right in front of me, but got some distance. Sirotkin got closer but I controlled a distance where he never got close enough to make a fight. I eventually ended up finishing in P2. A result I am happy with. I was driving clean and fast, we got a good pit stop, and together with my team Virtuosi UK, we made a good race strategy and performed this strategy very well. Very nice job guys! Race 1 was a strategic, clean, fast and good race. Tomorrow, on Sunday, I will start on P7. I had a good pace today, and have a good feeling. It will be #Vikinghorns in action. Ready for round 5 in Portimao, Portugal. 02.06.2012 It is time for racing again, and this time I am racing in Portugal. 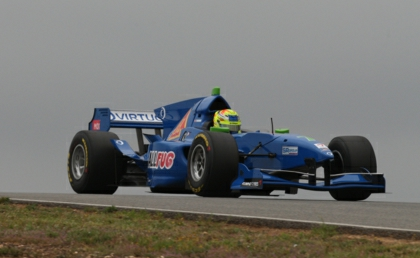 The fifth round in the Auto GP World Series is located in Portimao, Portugal, on the Algarve coast in Portimao. 18.05.2012 GP2 teamet RAPAX tilbyr meg sete i Monaco! 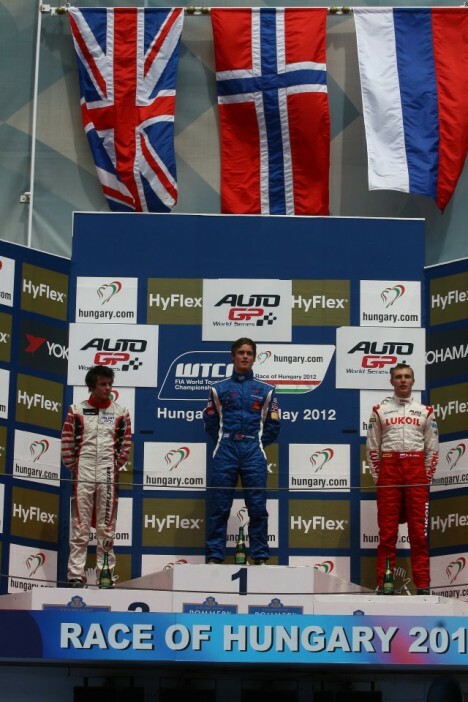 11.05.2012 The weekend in Hungaroring has been very exciting. In race 1, on Saturday, I started in P3. After the two first corners I was up on a P2, behind Sirotkin. In the end of the first lap I got in front of Sirotkin and was leading the race. I closed the gap into the last corner, so Sirotkin couldn’t get room to pass. This seemed to be too frustrating for Sirotkin, as he lost his head into the last corner, and went inside on the pit lane entrance and jumped into me and crashed me out of the track. Still I managed to get into the track and finish my race. My car got pretty damaged by this collision. My front wheels was crooked. My steering wheel was turning to the right over the straights, and I had under steering into all right corners, and the car was quite unstable into all left corners. Even though, Sirotkin damaged my car pretty bad, I am pretty happy with the results, as I dropped down to P9, and advanced to P5 in the end of the race with a broken car. A P5 in this high level of racing is very good, so a P5 with a broken car is a result I am pretty happy with. 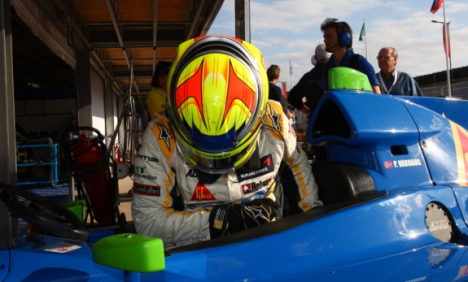 05.05.2012 This weekend it is time for my fourth round in Auto GP World Series. This time the racing will happen on the legendary Hungaroring circuit in Budapest, Hungary. I have raced on Hungaroring many times before. I have won races in Formula Renault here, and the last years I have been racing Formula Master, GP3 and GP2 on this circuit. Hungaroring is a circuit often associated with Monaco, because of its many corners and short straights. It is a very technical circuit, it is an exciting circuit, and it is a circuit where anything can happen in a race. Personally I like this circuit, so I am looking forward to race here. 14.04.2012 In race 1 in Marrakech, Morocco, I started in P2 on the starting grid. After the lights went off, I got a good start and got in to the lead in the first corner. The first laps I had some problems getting heat into my tires fast enough, so it was tough to keep in front of Campana, but after a few laps, my tyres got enough heat in the tires the situation improved lap after lap. I started building a gap, and managed to keep an easy controlled lead. Power start in Morocco! P2 on qualifying! 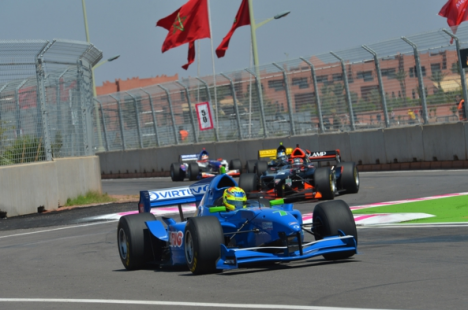 14.04.2012 Round 3 in Auto GP World Series is located in Marocco, on the streets in Marrakech. This is the fourth street circuit I have driven on, where I have driven on the streets of Pau, Monaco and Valencia before. I actually visited Morocco and Marrakech when I was a child, so it is pretty cool to come back here to drive in Marrakech.